There’s an unexpectedly special place hiding in an unassuming gray brick building at the corner of 26th and Stevens in Minneapolis’s Whittier neighborhood. There’s no sign to tell you it’s there, but if you venture up to the second floor on certain afternoons of the week and walk through a door just off the lobby area, you’ll find yourself in the tasting studio of Bingley’s Teas Limited. 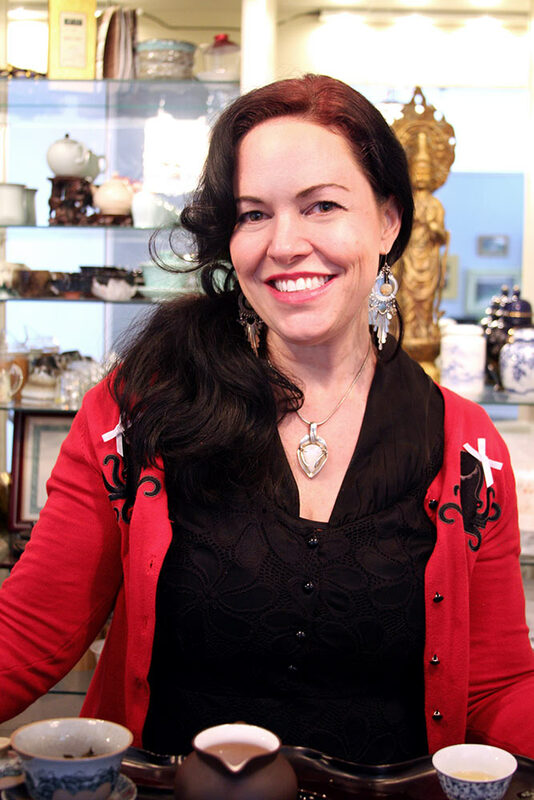 Most likely, you’ll be greeted by a woman standing at an ornate wooden counter, surrounded by tea, tea pots, and seemingly any tea implement you could possibly need; go farther inside and you’ll find even more teas and accessories for sale. 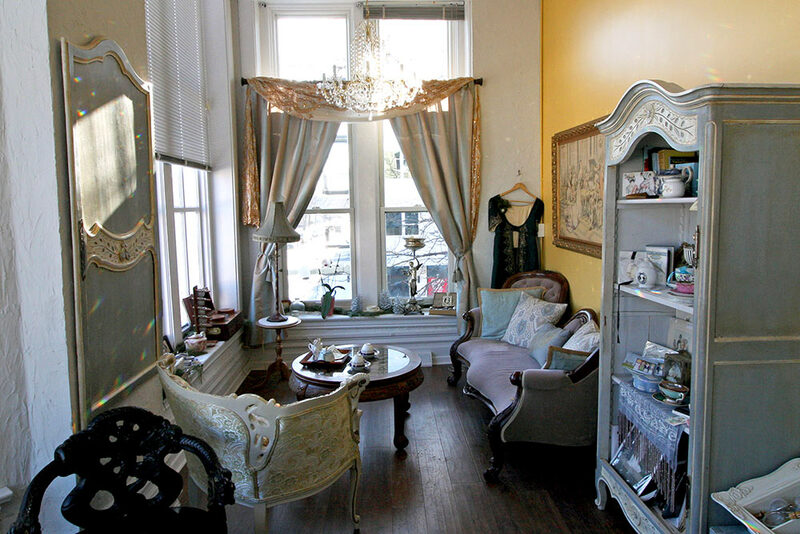 At the back, there’s an inviting set of Victorian furniture in a cozy, sunny seating nook. The friendly shop dog, Charlie, will follow you around for pets. The woman at the counter is Julia Matson, owner and tea purveyor of Bingley’s, which has operated virtually since 2008 and went brick-and-mortar with this space last spring. If you’re familiar with the business, there’s a good chance it’s through the Jane Austen Tea Series, which has offerings like Mr. Darcy’s Pride (an oolong with “distinctive notes of leather, chestnut and plum”) and Compassion For Mrs. Bennet’s Nerves (a floral tisane) and has brought Matson to Jane Austen conferences and conventions around the country. But while many “themed” teas you might find out there aren’t worth much more than the gimmick, Matson’s love and knowledge of Austen are equally matched by her love and knowledge of tea. Julia Matson, the force behind Bingley’s Teas. That wasn’t always the case; in her family’s house growing up, a basic bag of Lipton was the norm. It wasn’t until she was an adult that she had her first truly amazing cup of tea, and it wouldn’t be an exaggeration to say that cup changed her life. “It was like this whole new world opened up,” Matson says. Suddenly aware of what tea could really be, she dove headfirst into learning and tasting everything she could. Ultimately, that led to attending the New York–based Specialty Tea Institute, home to the country’s first standardized and accredited program for tea education. (Bill Waddington, founder of the Twin Cities’ own TeaSource, was among her instructors.) From there, she traveled around the country and around the world to learn more about tea, culminating in a study program in Taiwan. A sampling of what’s for sale. Two things led in large part to Matson launching her own business: wanting to be around tea even more than she already was and being frustrated with existing online tea sellers, whose quality could often be inconsistent. With the goal of giving people a place to go online for reliably high-quality tea, Bingley’s was born. Originally, Matson says, she was hesitant about creating the Jane Austen line—she had always been wary of people doing anything to commercialize her favorite author, and she knew that if she did it, she’d really have to do it right. In the end, she settled on creating blends to reflect different characters’ backgrounds and personalities, which she felt did Austen justice. She was still worried that the Jane Austen Society (of which she’s a member) might raise an eyebrow, but happily they seemed to approve of the end result. And the Jane Austen teas aren’t the only offerings here for book lovers. Some of Matson’s other teas have literary connections as well—like Khaleesi, an intense, roasty oolong (a type of tea whose name literally translates to “black dragon”). She’s also considering more themed lines, so you might see future teas honoring Doctor Who, The Hitchhiker’s Guide to the Galaxy, or Penny Dreadful. The light-filled seating nook at Bingley’s. Julia Matson notes that visitors can get a bit of English Regency and Victorian flavor but without an overload of lace and doilies. 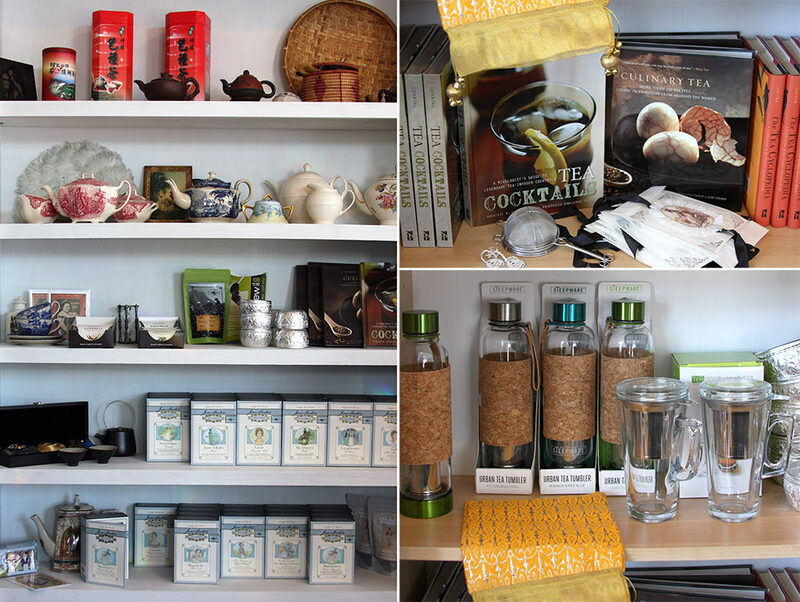 In addition to online and at the tasting studio, you can find Bingley’s teas at a growing number of restaurants and bars throughout the Twin Cities, both by the cup at places like Gyst and just-opened Chinese restaurant Jun and incorporated into cocktails at Eat Street Social, Icehouse, and Borough, among others. (For the winter cold, a hot toddy with brandy oolong may be just the thing.) Matson personally holds tasting sessions for the staff of each establishment to make sure the staff know the proper way to get the brews tasting the way they should. 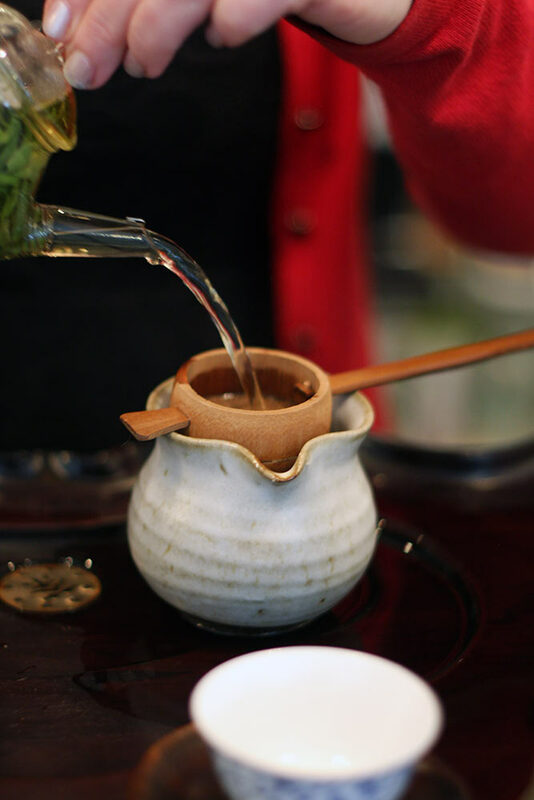 She brews in the gongfu-cha style, which involves small quantities, multiple steeps, and, in the case of her in-studio tastings, a beautiful wooden brewing tray with a seated Buddha tea pet. Although all of the teas she sells can be brewed “grandpa style”—that is, steeped in a bigger pot in a single batch—gongfu allows for precise control and revealing the different flavors of a tea that might come out on the first “wash” versus a second, fifth, or even fifteenth steeping. In some ways, it’s to tea what pourover is to craft coffee, but with more steps and a little bit of ritual. Brewing gongfu style. The lidded bowl is a brewing vessel called a gaiwan; the brewed tea is poured from there into the serving vessel on the right. But Matson wants people to know gongfu isn’t as complicated as it might look, and that anyone wanting to step up their game from grandpa-style brewing shouldn’t feel intimidated. 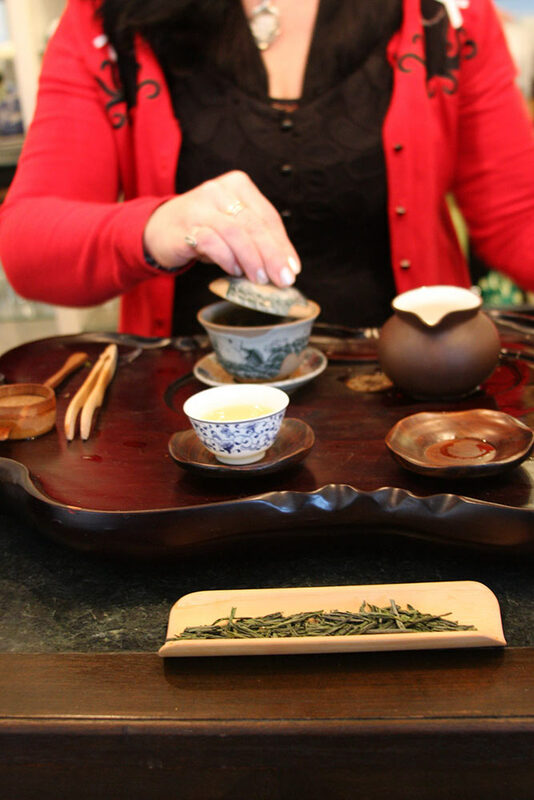 “If you can brew looseleaf tea, you can do gongfu,” she says. “I’ve even done it out of the country, in a hotel room, with paper cups.” She suggests starting with a small Western-style teapot, which can feel more familiar than a gaiwan, the Chinese lidded-bowl brewing vessel. 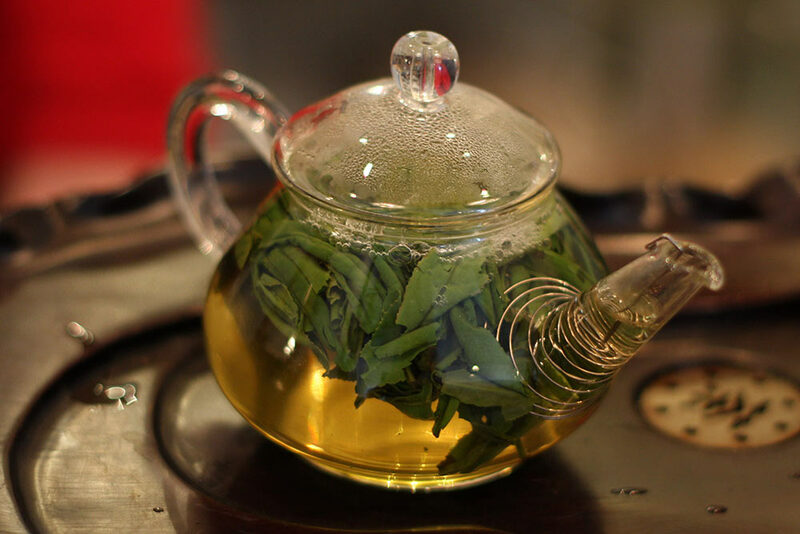 (Once you get the hang of it, though, a gaiwan can allow you to do more things with a tea, since the wide mouth means you can stir the leaves as they steep to get different results—especially great for oolong, Matson says.) It is, she admits, more time consuming than brewing with a basket or a tea ball—in the early morning when she just needs her caffeine, even she makes her English breakfast the “simple” way—but the involvement can be part of the fun. Sitting around with friends to watch the process and enjoy the way each steeping is slightly different from the last can be more interactive and personal than sharing a pot of batch-brewed tea. You don’t have to use a gaiwan to brew your tea gongfu style—tiny teapots come in a more Western style, too, and might be an easier introduction to the method. The leaves are free to unroll and bloom instead of being confined to a tea ball or basket, and the glass means you can watch the whole beautiful process. That personal connection is one of the things Matson loves most about having the studio space. Seeing someone try a new tea for the first time is always exciting, especially if they’ve never had anything like it before—after all, that’s how she got started on this whole journey herself. 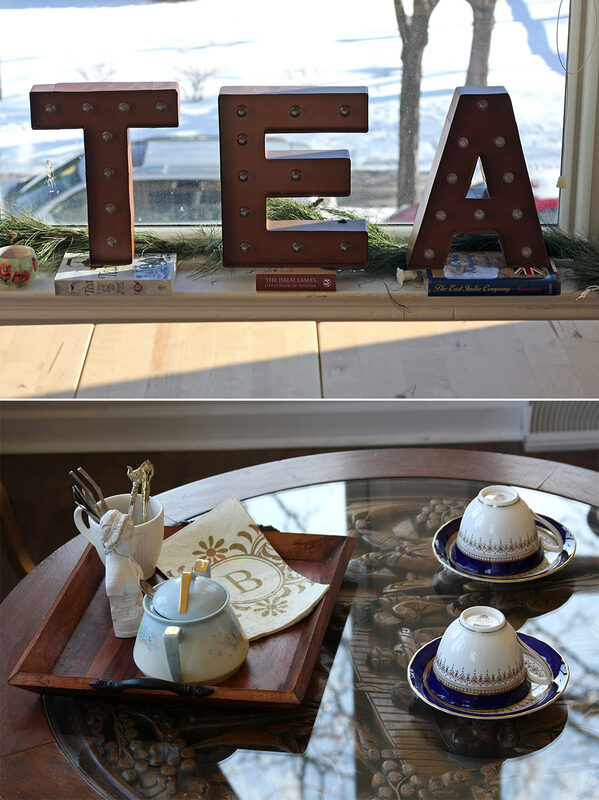 She wants her space to be welcoming, safe, and inclusive; she’s a tea geek, not a tea snob, and you shouldn’t feel like you have to know anything about tea to visit Bingley’s. In the new year, she’s hoping to add events like tasting classes and author readings to encourage even more people in the community to come together over tea. 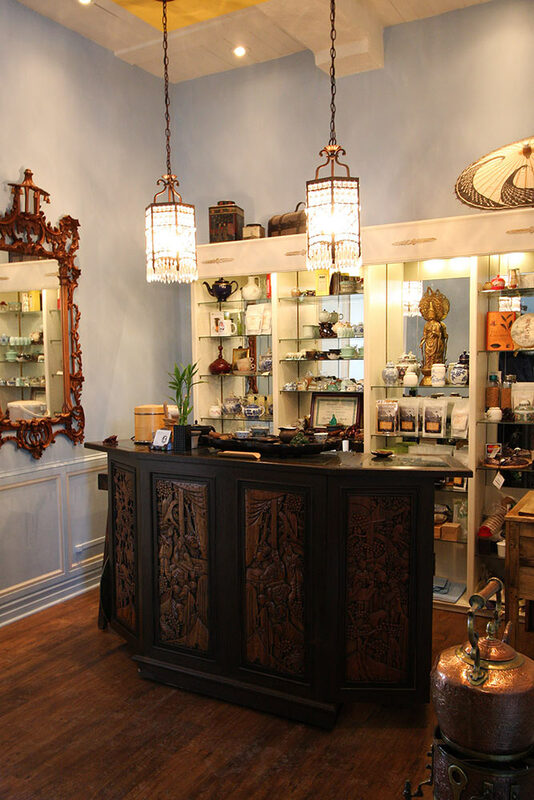 Bingley’s combines traditional and modern, as well as English and East Asian styles—both when it comes to the tea and when it comes to the space. The Bingley’s tasting studio is located in Suite 208 of the Tanek Building at 118 East 26th Street, Minneapolis, open Wednesday through Saturday 12:00 to 4:00 p.m. and by appointment. Tastings are $5 a person—either for a more formal tasting or for a pot or two you can enjoy with your friends in the cozy window nook pictured above. You can learn more at bingleysteas.com or by following Bingley’s on Twitter, Facebook, or Instagram.